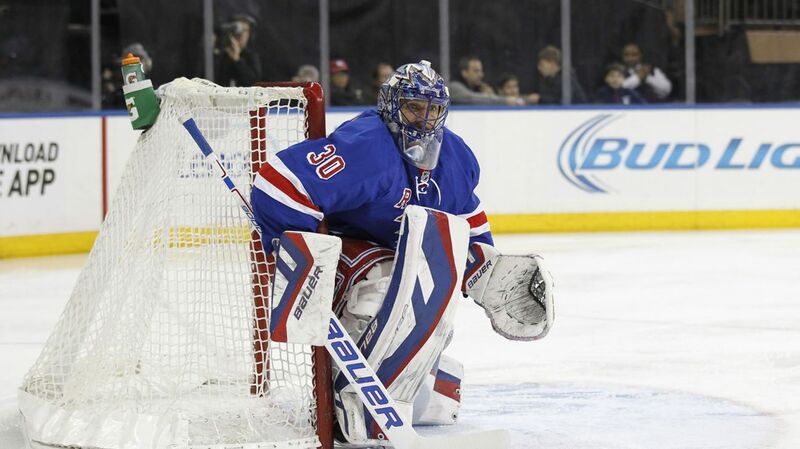 Henrik Lundqvist has been cleared for full practices, meaning that he could be in a game very shortly. Photo courtesy of MSG Photos. This afternoon, the Rangers announced that following an exam with doctors and specialist, star goaltender Henrik Lundqvist has been cleared for full practices, meaning that he is close to making his return. Alain Vigneault has said previously that Lundqvist will need about three or four full practices before he is game-ready again. Henrik has been participating in intense conditioning drills, workouts, and goalie drills, so that will not be a problem. The practices will help him get back to being able to track the puck with bodies in front of him. This is a huge boost to an already top-notch team. When Lundqvist went down with injury, the Rangers stepped their game up as Cam Talbot took over a starting role for the first time in his career. They stepped up their game offensively and defensively, becoming a better all-around team. Lundqvist has missed 20 games, but the Rangers still managed to pull together a 15-2-3 record since February 4th. With Lundqvist in net, it may take some time for him to get back into game form, but once he does, the Rangers will be an even tougher team to defeat. Any line Rick Nash is on is the top line. That was last year’s mainstay line through most of the regular season and the playoffs. Derek Stepan is pointless in his last 10 games, so maybe putting him alongside Nash will help the two of them get going again. Chris Kreider often creates openings with his size and speed, so Nash will get a lot of quality opportunities. Kevin Hayes was bumped up to the second line in the absence of Martin St. Louis. 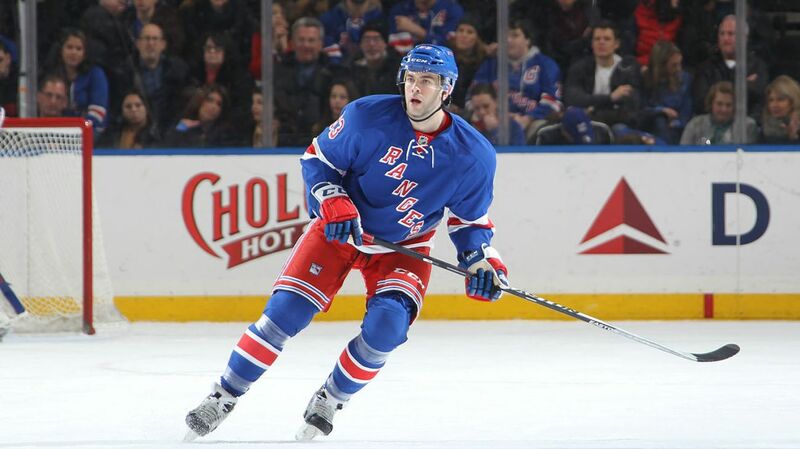 He is alongside Derick Brassard and Mats Zuccarello, two excellent playmakers and passers. 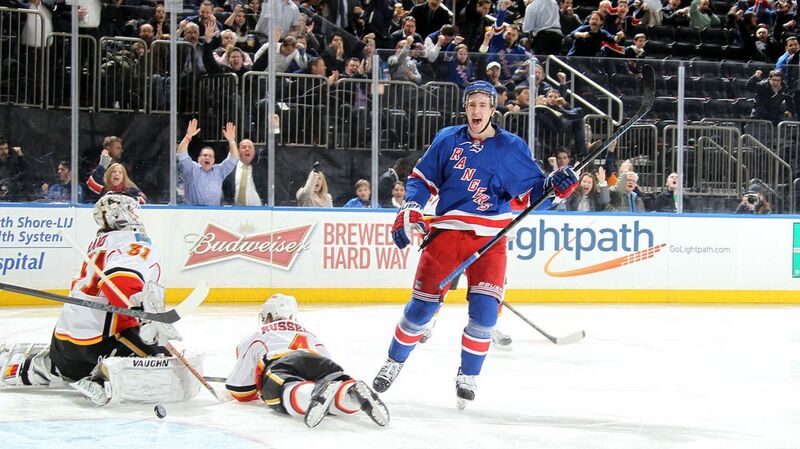 Hayes did well alongside these two when Rick Nash missed a game due to neck spasms, scoring the game winning goal. My only worry is that all three of these guys can be pass-first players, so hopefully someone assumes the role of the shooter. Derick Brassard and Mats Zuccarello have not been scoring a ton of goals lately, so hopefully this line continues to have success. Kevin Hayes had success when he played alongside Derick Brassard and Mats Zuccarello earlier this season, scoring the games only goal. Photo courtesy of MSG Photos. Newcomer James Sheppard now gets a chance to prove his worth in the lineup to Vigneault. Sheppard has played a lot at center, and is a quality faceoff man. He scored his first goal as a Ranger in Sunday’s win over the Panthers, and will play alongside the speedy Carl Hagelin and JT Miller. Vigneault decided to go back to four forwards on the top unit after previously saying that he would stick with two defenseman on each line. Kevin Hayes will center the second unit, which is something I really like. Hayes hasn’t seen much power play time this year, but has one goal in the little time he has had on the man advantage. Hayes is really crafty and a good playmaker, so this could work well for the Rangers. Keith Yandle will need to help the Rangers struggling power play (19th in the NHL) find success again. The man advantage is a crucial part to sustained success throughout a season and postseason. Photo courtesy of MSG Photos. New York is 0-14 on the man advantage in the last five games, and just 1-21 in the last eight games. Clearly this is something that needs to change to sustain success, and Keith Yandle needs to start shooting more and helping the power play flourish. The Rangers play tomorrow night at Madison Square Garden against the Chicago Blackhawks. Posted on March 17, 2015, in Rangers Updates and tagged Alain Vigneault, Buffalo Sabres, Cam Talbot, Carl Hagelin, Chris Kreider, Dan Boyle, Dan Girardi, Derek Stepan, Derick Brassard, Dominic Moore, Henrik Lundqvist, James Sheppard, Jesper Fast, JT Miller, Keith Yandle, Kevin Hayes, Kevin Klein, King Henrik, Mackenzie Skapski, Madison Square Garden, Marc Staal, Martin St. Louis, Mats Zuccarello, Matt Hunwick, MSG, MSL, New York Rangers, NHL, NHL 2014-2015 Season, NY Rangers, NYR, Rangers, Rangers Nation, Rangerstown, Rick Nash, Ryan McDonagh, Tanner Glass, The Ranger Zone. Bookmark the permalink. Leave a comment.